The January/February issue of Mutineer Magazine will start showing up on newsstands over the next week or so, and we are proud to say that it is the most mutinous issue yet! 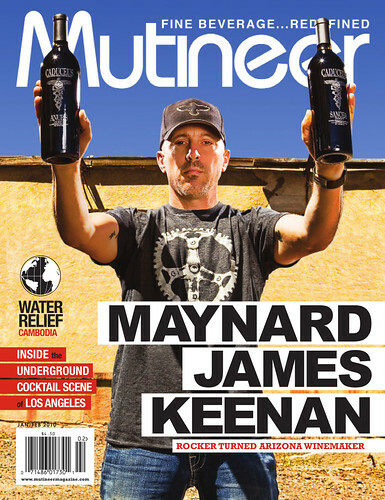 The Mutineer RV made it’s way to the unforgiving Arizona Desert for an exclusive interview with Caduceus Cellars winemaker Maynard James Keenan, who has already rocked the world several times over as the frontman of bands including Tool, A Perfect Circle, and Puscifer. Brewer Cody Lee Morris of the Seattle start-up brewery Epic Ales tells his underdog story bringing his dream brewery to life. Burnt Lumpia blogger Marvin Gapultos offers a rare look at the secret underground cocktail culture of Los Angeles, featuring original paintings by Brent Estabrook. Mutineer veteran scribe Jesse Porter of the Young Winos of LA goes Gonzo in this piece that explores the exploding craft spirits scene in the United States, featuring Finger Lakes Distilling, Tuthilltown Spirits, Philadelphia Distilling, and Dry Fly Distilling. Subscribe now to receive a copy of this issue! Yes! Maynard rules, I can’t wait to read that interview. This issue is EPIC because it features me. I must have had my blinders on when I checked this out the other day. I just realized that Marvin Gapultos contributed to this issue! He has such a great style.